At least 11 people are dead and others are injured, including police officers, following a Saturday morning attack at the Tree of Life Synagogue in Pittsburgh, according to reports. Follow updates from Breitbart News on the latest developments. All times eastern. ► Robert Bowers is identified as the suspected gunman who killed at least 11 people after opening fire on the Tree of Life Congregation Synagogue in Squirrel Hill, Pittsburgh. 6 were injured, 4 police officers were hurt. ► Bowers shouted ‘All Jews must die’ as he shot congregants. ► The shooting took place during a baby naming ceremony. ► President Trump denounced the shooting and said the facilities may have been lower if armed guards were protecting the building. ► Federal authorities have filed 29 charges against Bowers. 9:49 PM — The man suspected of killing 11 people at a synagogue in Pittsburgh has been charged with obstructing the exercise of religious beliefs resulting in death, according to the Associated Press. Federal prosecutors say Robert Bowers was charged Saturday night in a 29-count criminal complaint. It wasn’t immediately known if he has an attorney. The charges also include 11 counts of using a firearm to commit murder, weapons offenses and charges alleging Bowers seriously injured police officers while obstructing the exercise of religious beliefs. Authorities said six people, including four police officers, were also wounded during Saturday’s shooting at the Tree of Life Congregation in Pittsburgh’s Squirrel Hill neighborhood. 7:24 PM — Mourners in Pittsburgh are holding a vigil in memory of the victims killed at the Tree of Life Congregation Synagogue. 6:15 PM — President Trump says he will be going to Pittsburgh after the synagogue attack. 5:25 PM — Police departments in several Phoenix-suburbs are stepping up visibility and patrols around houses of worship in their communities in the wake of a shooting at a Pittsburgh synagogue in which 11 people were killed, according to the Associated Press. Television stations KTVK/KPHO report that cities where police said Saturday they’re stepping up patrols and taking other steps include Chandler, Mesa, Tempe and Scottsdale and that several police departments’ spokesmen said synagogues will get special attention. Sgt. Ben Hoster of the Scottsdale Police Department said there weren’t any credible threats against religious institutions in the area bu that the extra precautions being taken are intended to ensure their safety. 4:39 PM — Criminal charges against Pittsburgh shooting suspect Robert Bowers could be filed as early as today. Special agent in charge of Pittsburgh office of the FBI: We have no knowledge that suspect was known to law enforcement before today, says FBI believes he was acting alone. 4:13 PM — No children are among the dead. 4:08 PM — Unsurprisingly, Never Trumper David Frum finds a way to implicate President Trump in the shooting. 3:47 PM — President Trump will not cancel tonight’s rally in Murphysboro, Illinois. 3:19 PM — Sources tell KDKA-TV that at least 11 people were killed in the Pittsburgh synagogue shooting. #BREAKING NEWS: KDKA-TV sources confirm that at least 11 people have now died at the #Pittsburgh Synagogue mass shooting. 4 police officers shot, 2 of them in critical condition. 3:03 PM — Sources tell the Associated Press that at least 10 people were killed in the Pittsburgh synagogue shooting. NEW: Anti-Defamation League calls shooting at Pittsburgh synagogue "likely the deadliest attack on the Jewish community in the history of the United States." 2:45 PM — WPXI’s Courtney Brennan reports law enforcement had “interactions” with Robert Bowers in 2004, the nature of which is presently unknown. UPDATE:Sources say Dormont police had interactions with alleged gunman Robert Bowers in 2004. 2:31 PM — President Trump speaks to reporters about the Pittsburgh synagogue shooting. 2:24 PM — In wake of the deadly shooting, President Trump told reporters aboard Air Force One that he may cancel tonight’s rally in Murphysboro, Illinois. President Trump spoke to reporters on Air Force One and said he's considering cancelling tonight's rally in Illinois. Vice President Pence calls the Pittsburgh synagogue shooting "an attack on innocent Americans and an assault on our freedom of religion"
In light of the tragic events unfolding in Pittsburgh this morning. MPD will be providing an increased presence at our synagogues in the city. Our Special Liaison Unit will be contacting religious leaders. There is no known credible threat to Washington, DC. 1:55 PM — Israeli Prime Minister Benjamin Netanyahu says he is “heartbroken and appalled” by the shooting. “The entire people of Israel grieve with the families of the dead. We stand together with the Jewish community of Pittsburgh, we stand together with the American people in the face of this horrendous anti-Semitic brutality and we all pray for the speedy recovery of the wounded,” a statement via Netanyahu reads. 1:32 PM — Officials say the Pittsburgh synagogue shooting suspect has been identified as Robert Bowers, the Associated Press reports. 1:29 PM — Hot take from journalist Joshua Albert, who has bylines on the Daily Beast and Philly Mag, per his Twitter bio. 1:26 PM — Hissrich cannot confirm the number of fatalities, says 6 are hurt, 4 of them are police officers. 12:58 PM — The NYPD has deployed officers to Jewish centers throughout New York City in response to the shooting. 12:28 PM — Before boarding Air Force One, President Trump said the shooting has “little to do” with the country’s gun laws. “If they had some kind of a protection inside the temple maybe it could have been a much different situation,” the president told reporters. “To see this happen again and again, for so many years, it’s just a shame,” President Trump added, before suggesting all mass shooters should be given the death penalty. 12:26 PM — President Trump spoke with Pittsburgh’s mayor and the Gov. of Pennslyvania about the shooting, and will issue another statement on the horrific events later Saturday. 12:35 PM — Congregants say the shooting occurred during a circumcision and naming celebration, referred to as a bris, NBC reports. 12:22 PM — GQ magazine correspondent Julia Ioffe blames the shooting on President Trump’s decision to move the U.S. embassy to Jerusalem. 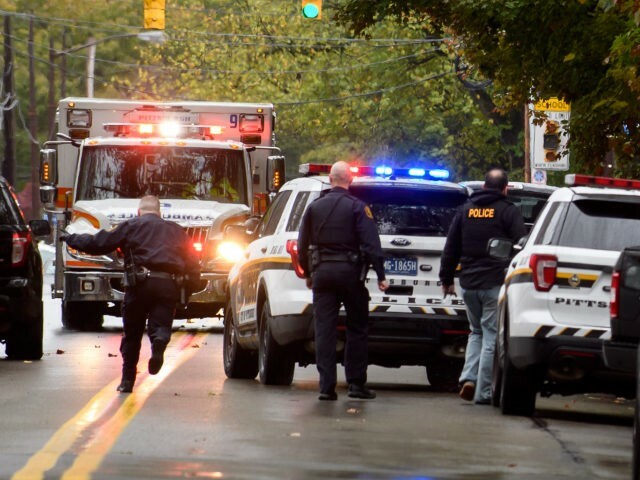 11:50 AM — KDKA reports that the attacker walked into the synagogue and allegedly screamed, “All Jews must die.” He struck the synagogue during Shabbat services and the synagogue was “full of people” at the time. 11:32 AM — Pittsburgh Steelers send thoughts and prayers to those affected by the shooting. 11:08 AM — President Donald Trump asks Squirrel Hill residents to remain indoors as the active shooting unfolds. 10:34 AM — KDKA reports that the number of fatalities may rise, as police are still working to get people out of the building. The attacker opened fire on police when they responded to first reports of shots fired. Two officers were wounded as a result.